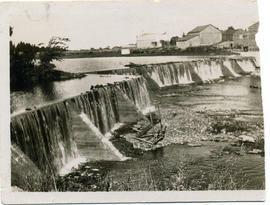 File contains a newspaper clipping regarding the 1967 sale of the Cannifton Grist Mill and an article regarding the Cannifton Grist and Sawmill destroyed by fire. File contains the 1967 Annual Report of St. Mark's United Church in Cannifton. File contains a Christmas letter touching on memories from Cannifton. File contains newspaper clippings about the people of Cannifton, including a photo of the 1911 Boy Scouts and a 60th wedding anniversary announcement for Mr. & Mrs. Ryan Keller in 1957. File contains a newspaper clipping about the Corbyville Women's Institute (W.I.) acquiring a new hall. 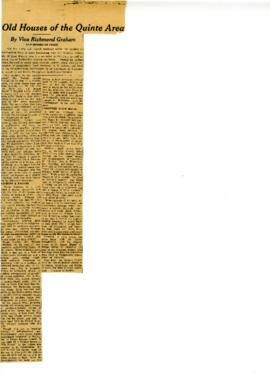 File contains a newspaper clipping about a man who escaped from a Montreal jail was recaptured in Cannifton. The file contains an original copy of the handbook "Regulations and Programme for Religious Education in the Public Schools, 1949" from the Cannifton-Corbyville Public School, Thurlow Township School Area.